UPDATED 2.07PM | Prime Minister Dr Mahathir Mohamad today announced the dissolution of five government bodies and committees - the National Council of Professors (NPC), the Federal Village Development and Safety Committees (JKKKP), the Prime Minister's Department and Performance and Delivery Unit (Pemandu), the Special Affairs Department (Jasa) and Land Public Transport Commission (Spad). He made the announcement during a press conference following the new cabinet's first meeting today. In the case of the federal government-appointed JKKKP, the premier said the committee was also becoming too politicised and that its role could be carried out by other government offices. Similarly, he said the NPC had also diverted from its role of providing the government with academic information, into a political body used to prop up the old BN government. "Whether it will be brought back in a different form is uncertain," he added. Meanwhile, the responsibilities of Spad would be absorbed by the Transport Ministry, he said. The government will also look into dissolving other advisory agencies formed under the previous BN government. 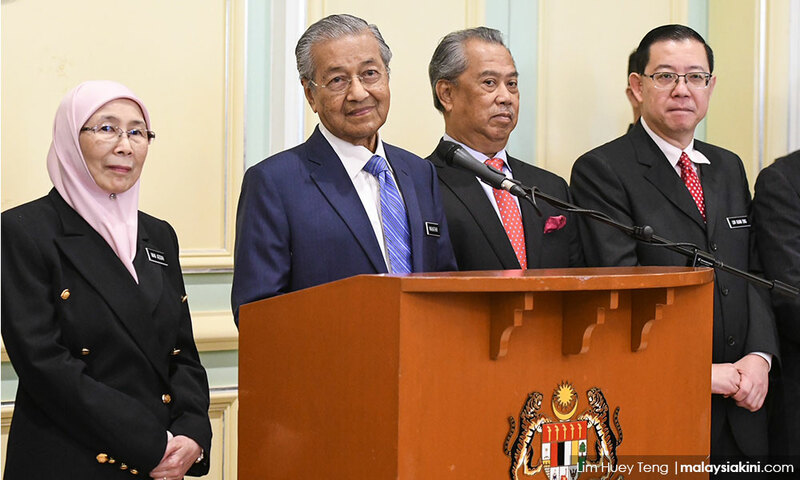 On a separate matter, Mahathir said the government would also be reviewing projects launched under former prime minister Najib Abdul Razak. This includes the Kuala Lumpur-Singapore High-Speed Rail, the East Coast Rail Link (ECRL), and Bandar Malaysia. Tomorrow, 9 May 2018, offers a golden opportunity to many of us who wish to see Malaysia great again. For so long, we have craved for a democratic and peaceful Malaysia where the people are not divided by issues of race or religion, but who are united by their love for, and loyalty to, this unique country of our birth. We know that it is possible for Malaysia to shine again. We know this because of the massive turnouts at the ceramahs held over the last 10 days. Malaysians of all races gathered together, packed shoulder to shoulder, even braving the rain, to eagerly hear the message of hope and the promise of change delivered by Pakatan Harapan leaders. The participation of former UMNO stalwarts at these events has lifted up our spirits even higher and given us even more confidence that we will have a new and capable government when the votes are counted. There is no need to list the criminal deeds of the BN government over the past decade which have caused immense suffering to ordinary Malaysians, and the worldwide ridicule which has been heaped upon Malaysia. Instead, for now, we must focus our energies on getting out the voters and guarding the ballot boxes. It is everyone’s duty to go out to vote tomorrow. Many young Malaysians have registered to vote for the first time – please turn up as this election will determine your future and that of your future generations. Now, more than ever before, every vote counts. Our country needs you to take action! Let us look forward to a new dawn for Malaysia on 9 May 2018. Together, we can make history by voting in a new government for Malaysia. It has been a long time coming, and we are ready! Pakatan Harapan, New Dawn, New Hope!